Pairs of travellers are pitted against each other in a race to reach the Far East, without taking a single flight and with no smartphone in sight. If you were tasked to race across the world with limited cash and nothing in the way of modern technology, how do you think you’d fare? This Spring, a brand-new BBC Two series will see five teams attempt just that. 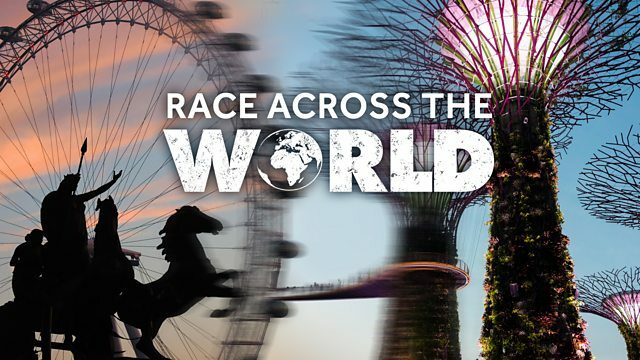 Race Across The World takes viewers on the trip of a lifetime, following our contestants as they embark on an epic and adrenaline-fuelled adventure, travelling into the unknown without the trappings of modern life. Our five pairs set off on a race to Singapore without taking a single flight. They will leave behind their smartphones, internet access and credit cards, and will be armed with only the cash equivalent of a one-way airfare to Singapore, the furthest destination by land and rail from the UK, to pay for the entire journey. If they run out, they'll need to earn more. In a competition that sees our teams travel through rather than fly over, their skill, ingenuity and determination will be tested to the extreme as they race through some of the world’s most beautiful scenery, form bonds and friendships across cultural divides and rely on the kindness of strangers in order to stand the best chance of winning. Now in their late 50s Sue and Clare have been lifelong friends since school and want to re-live and recapture the magic of the cross-Europe trip they made together 30 years ago. A chance encounter helps them realise they should have put a bit more planning into this crucial first leg. With his copy of Sophocles in his rucksack, Felix, along with business partner Josh, is impatient to get going but quickly finds out how easy it is, with an estimated 50 days of the journey still to go, to burn through their budget. Natalie and Shameema, best friends since they met at school aged nine, are determined to save money and so adopt a very focused strategy to do just that – be nice to people along the way, in the hope they will repay this kindness with a train ticket or two. Will it work? Married couple Jinda and Bindu’s strong negotiation skills stand them in good stead but an unexpected emergency has their trip hanging in the balance. And as the first day draws to a close, father and son, Darron and Alex have yet to leave London – they’re patiently waiting for an overnight coach to Germany, aiming to leap-frog their fellow competitors and get ahead of the pack in the dash to Delphi. The race is on, and the stakes are high - everyone wants to be first to the finish line and win the cash prize. As the series unfolds we will see chance encounters, cultural revelations, friendships formed, relationships tested and bonds strengthened as the teams experience, and come face-to-face with, some of the most awe-inspiring locations that modern-day travellers seldom get to see. The dramatic scale and thrilling unpredictability of the race is sure to change their lives forever. The Race Across the World has begun. Meet the couples who are in a race to reach Singapore - without setting foot on a plane. Do you have the skills to take on the challenge of a lifetime?